The environment continues to be a cause of major concern for publics around the world. Majorities in 14 of the 24 countries surveyed rate global warming as a very serious problem, and the proportion offering that view has increased since last year in 11 of the 20 countries for which trends are available. The poll also finds that publics in 10 of the 24 countries surveyed have the most confidence in Germany to do the right thing in protecting the world’s environment. Nigerians, South Africans, Mexicans, and Tanzanians express the most confidence in the United States. Solid majorities in every country surveyed say global warming is a serious problem, and majorities in 14 of the 24 countries say it is “very serious.” Nearly every Brazilian (92%) and at least two-thirds of the publics in Turkey (82%), Tanzania (75%), Japan (73%), France (72%), Argentina (70%), Mexico (70%), South Korea (68%), and Spain (67%) consider global warming a very serious problem. Among the publics included on the survey, the Chinese express the least concern about climate change – only 24% say it is a very serious problem. Anxiety about global warming is also low among Lebanese (43%), Americans (42%), Jordanians (41%) and Egyptians (38%). Concern about global warming has increased in many countries since 2007. In Great Britain and Poland, where fewer than half said climate change was a very serious problem a year ago (45% and 40%, respectively), majorities now rate it as very serious (56% in Britain and 51% in Poland). And in Russia, where 40% rated climate change as a very serious problem and 58% said it was less serious or not a problem in 2007, the public is now divided – 49% say it is a very serious problem and 46% see it as less serious. In four countries – China, Japan, South Korea, and the United States – publics are less worried about climate change than they were in 2007. The change has been most dramatic in China, where the proportion who rate global warming as a very serious problem has dropped 18 points, from 42% last year to 24% in the current poll. In the U.S., where 42% say global warming is a very serious problem, compared with 47% in 2007, Democrats express the most concern – 58% say it is very serious – and Republicans continue to be the least concerned (25% say it is very serious). However, most of the recent decline in the number rating global warming a very serious problem has occurred among politically independent respondents. About four-in-ten independents (41%) now rate global warming as a very serious problem, compared with nearly half (49%) a year ago. By a significant margin, publics in 13 of the 24 countries surveyed name the United States more than any other country as the world’s top polluter. This view is especially prevalent in Argentina (54%), Spain (51%), and Pakistan (51%), where more than half say the U.S. is hurting the world’s environment the most. More than four-in-ten in Turkey (46%), Brazil (44%), and Indonesia (42%) also place clear blame on the United States, as do smaller pluralities in several other countries, including its neighbor to the south; 38% of Mexicans fault the U.S. for global environmental problems. In the Asia-Pacific countries of Japan, South Korea, and Australia, neighboring China is seen as the biggest contributor to global environmental problems. Fully two-thirds of Japanese and about the same share of South Korean respondents (64%) identify China as the world’s major polluter. In Australia, fewer than half name China (46%), but even fewer name the United States (24%), which receives the second most mentions in that country. Aside from the Japanese, South Koreans, and Australians, Americans are the only other public surveyed that sees China as a considerably bigger threat to the environment than the United States. Four-in-ten Americans name China, while fewer than a quarter (22%) name their own country, a reversal from last year, when 22% placed the most responsibility for environmental problems on China and a third blamed the U.S. In no country is a nation other than China or the United States named by a majority or a plurality as the world’s top polluter. Poles, however, are about as likely to say Russia is most to blame for environmental problems (25%) as the U.S. (26%) or China (23%). 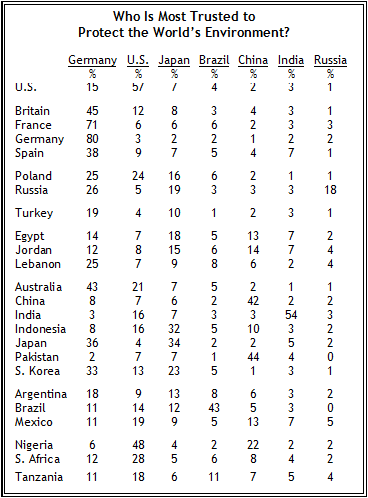 And Indians blame their own country (19%) as much as they blame China (21%) and the U.S. (21%). Criticism of China with respect to the environment increased markedly in 13 of the 20 countries since 2007. The shift has been most dramatic in Japan, where respondents blame China more than the United States by a 50-point margin (67% vs. 17%). Just last year, about as many Japanese blamed China (34%) as blamed the U.S. (36%). Less drastic but significant shifts have also occurred in Western Europe. In France, more than half (53%) saw the United States as the top polluter in 2007, compared with just 23% who named China. Today, the French are split – 34% blame China and 35% blame the U.S. The British are also about equally as likely to name each of the two nations; in 2007, the U.S. received considerably more mentions than China in both countries. When asked which country among Germany, the United States, Japan, Brazil, China, India, and Russia they trust most to do the right thing in protecting the world’s environment, majorities or pluralities in 10 of the 24 countries surveyed name Germany. Germans are the most likely to do so (80%), followed by the French (71%), the British (45%), and the Australians (43%). 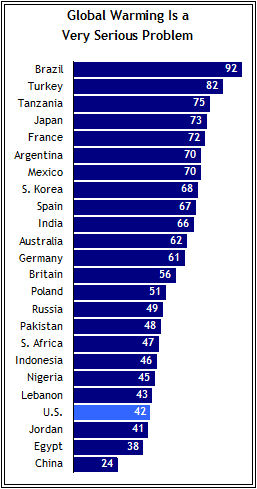 Indians, Brazilians, Chinese and Americans however, credit their own countries. Fully 54% of Indians identify India, 43% of Brazilians identify Brazil, and 42% of the Chinese name China as the country they trust to protect the world’s environment. Nearly six-in-ten Americans (57%) believe their country can be trusted to protect the environment. In no other country does a majority name the U.S., although nearly half of Nigerians (48%) express this view. The U.S. is also favored by smaller pluralities of South Africans (28%), Mexicans (19%) and Tanzanians (18%). In addition to Germany and the United States, Japan stands out among some publics as a nation that can be trusted to protect the environment. About a third of Indonesians (32%) name Japan, more than name any other country. Japan also receives the most mentions in Egypt (18%), although about the same number in that country mention Germany (14%) and China (13%). The Japanese are split – 34% trust their own country and 36% trust Germany the most when it comes to protecting the environment. Aside from the Chinese themselves, Pakistanis are the only public that name China more than any other country. More than four-in-ten in Pakistan (44%) say China is the country they trust the most to protect the environment. By comparison, the United States and Japan, which tie for the second most mentions in Pakistan, are each named by only 7%.